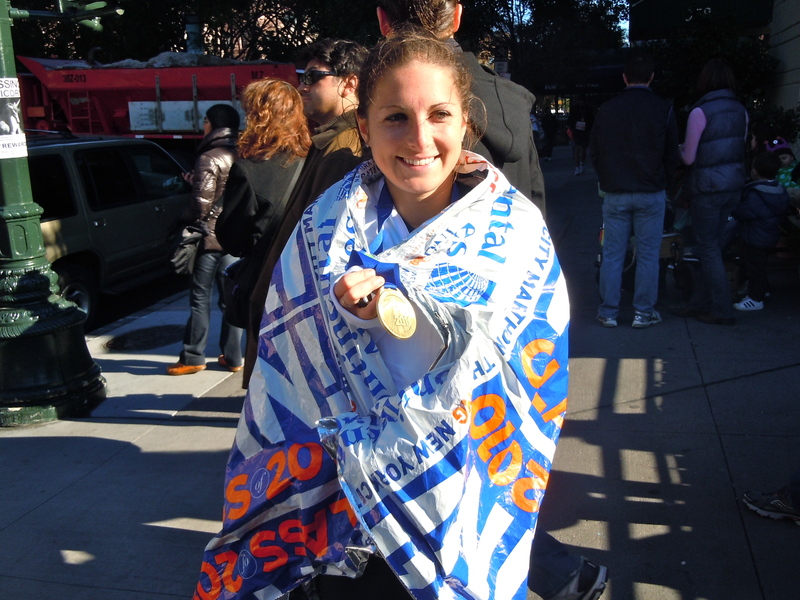 NYC Marathon Recap: 3:04:32! | Run, Lindsay, Run! It’s taken me a while to write this post. Part of me didn’t want to write this because a recap would mean that it’s really over! But the real reason it took me so long is because the night after the race, I headed back home to NJ and left early Monday morning to drive down to Maryland for my grandmother’s funeral. Needless to say, it’s been a tough few days between the race and this sad news, and I’ve been a bit emotionally (and physically!) drained. I finally returned back to work today, though, and really enjoyed sharing my race story with all my coworkers and thought it was about time to put it in writing! First things first: I FINISHED! And I rocked it with a 3:04:32 finish time! Overall, the day was one I hope I’ll always remember. It started bright and early, around 5:15am when I headed down to the NYPL to catch the bus to Staten Island. To my surprise, 3 other people were also trying to catch a cab on my block so we all split one down- the camaraderie begins! Two guys came from England to run, and one girl’s mother lives in the building next to mine– the girl and I rode next to each other on the bus and since she had done NY last year, shared stories and tips. It was a nice start to the morning, and got me excited to race! I had a nice breakfast on the bus of hot oatmeal with blueberries (which I microwaved for like 10 minutes and wrapped in my blanket to keep it piping hot to eat later–it worked!) and a small bit of Gatorade. When I got to the start village, I had my banana and two Clif Shot Blocks because, why not? I also drank a TON of water! I also had a hot cup of coffee in the cab to the bus– hey, I need my caffeine! Since I had a green bib, I wandered over to the green village, assuming the Local Competitive Start would be there. I was wrong. The local competitive start area was nowhere near the green village, despite us all having green bibs. Weird. I hung out there for a little bit and chatted with two guys I sat nearby along the fence. One had done 26 marathons, his first was 20 years ago to the day. The other had done NYC once. I felt like a total novice. How did I get into this local competitive start, anyway? I wasn’t affiliated with a local running club (“Yeah, I just run by myself…”), I had never run a Marathon (“Actually, I’ve only done one half-marathon in my life…”), and barely had done any road races (“Um, the NYC Half, and the JP Morgan Chase Corporate Challenge? We didn’t do any road races in college…”) Oh, and I’m only 23 and have no idea what I’m doing! I checked my bags around 8 (all the way in the green village…) and tried to keep warm until we were allowed on the bridge. A guy gave me an extra heat sheet he had, which was so nice! I needed it once the winds started getting stronger! Luckily I was in the 1st wave and just had to get to 9:40am to start. I think the rest of my story is best told through my mile splits. Mile 1: 7:25. The guns go off- unfortunately, we were on the lower level of the Verrazano, so I couldn’t really see any of the starting “fanfare” that I had heard so much about. I also missed the views off the bridge. It was completely shaded on the lower level, so it was freezing, and I didn’t take in any views. Instead, I tried to draft off people as much as I could but it was SO WINDY! Tried to stay steady here. Mile 2: 6:21. WHOA, this was a fast one. The entire mile is just about downhill, going down the bridge, so I didn’t think too much about it because I knew it wasn’t real. Oh, and my feet were SO COLD they felt like blocks of ice, numb, until I got off this bridge. Mile 3: 6:52. Good, I started easing into my pace. I shed my longsleeve shirt around this point, so I was just in shorts, tank top, and gloves. I didn’t expect to keep the longsleeve on for 3 miles. It was chilly. Miles 4 and 5: 13:23 total. I missed a mile marker here, 6:42 average between the two miles. Probably a mistake. Miles 6: 6:38. Fourth Avenue was MY FAVORITE part of the course. BETTER than First Avenue in Manhattan. The crowds were great, and I was feeling good. TOO good! I was rocking out to the bands, high-fiving spectators, and had a smile plastered on my face. At some points I actually laughed, especially when I saw funny signs or people cheered “Go Girl!” because I was in a sea of men. Then I realized I needed to start reigning my pace in a bit if I was ever going to finish this race. But I was having SO MUCH FUN! Mile 7: 6:42. I tried to slow down, but not by much, apparently. Mile 9: 6:55. This is the pace I should have been at! I felt comfortable here. Mile 15: 7:14. Got a little slower going up the Queensboro bridge. This was a long, gradual incline that had very little spectators on it. It wasn’t as hard mentally as I thought, but the quiet and the cold got to me. Mile 16: 7:11. Think some of this was still uphill on the bridge. Coming down the bridge, my left quad started hurting and my thoughts started getting a tad more negative. Mile 17: 6:57. This was the first mile on First Avenue. I tried to reign myself in not to get too caught up with the crowds. Truthfully, I felt myself having to work much harder to keep up this pace than I had. Mile 20: 7:15. WOW, did anyone know how deceptively long this gradual incline up the Willis Avenue Bridge was?! I certainly didn’t know. Or maybe it just felt worse because I was starting my slow, slow decline in pace. Mile 21: 7:11. The Bronx, I’m sorry, was uninspiring. Probably my least favorite part, especially the weird “add-on” we did circling some empty chain-fenced parking lot. Mile 22: 7:18. At this point, I had to really really start working to keep it together. Mile 23: 7:19. As soon as I clicked the watch for the end of this mile, I hit the wall. Mile 24: 7:47. WTF Fifth Avenue Hill why did you crush my soul? This was a low point. I tossed off my gloves to my dad, ripped off my 3:10 pace bracelet, I suddenly had the weird urge to get everything excess off me. Like it would make me faster, really? Mile 25: 7:25. Probably only a little quicker because part of this is downhill in Central Park. I don’t recall much of this mile. I really didn’t enjoy the Central Park portion as much as I thought I would. I couldn’t even muster the energy to take a water cup. I had tunnel vision, just needed to get to the finish. Like 2 miles ago. Mile 26: 7:33. I don’t remember exiting Central Park. I don’t remember any of the crowds on Central Park South. I think I was crawling at this point. I remember people walking and wanting to kick them and tell them to finish. You probably could have confused my shuffle with a walk. I don’t remember the song the band was playing as you re-enter the park. I remember the re-entry path being a sharp turn and quite narrow, and pitying the runners who would be much more packed up later. .2: 1:37. A very, very, slow, painful crawl towards the finish. In my head, I had visions of kicking into high-gear and powering home. I may have well been going backwards at this point. TOTAL TIME: 3:04:32. When I crossed the finish line, the woman who put the medal on my neck told me I was the first girl she “medaled” and that she was so proud of me. That was awesome! I hobbled the long, slow mile to get my bag. It felt like an eternity and I tried my best to stomach an apple and some Gatorade Recovery drink. In the end, I am so ecstatic with my finishing time, but looking back on my splits see I did not run a smart race. I had absolutely nothing to give at the end. I think if I had run some of those earlier miles closer to 6:55 pace, I definitely would have had more gas in the tank and found another gear at the end. I should not have been going SO much slower at the end. But then again, the last few miles will probably feel tough no matter what, so at least I gave it what I could. So, what’s next? Firstly: walking without waddling and being able to get down stairs. HA! But I’ll probably take some good time off running and start doing some other things I’ve wanted to, like pilates, walking, etc. And sleeping in! And rejoining society and being able to go out and have FUN on a weekend and not wake up hungover having to run 20 miles. Hope you all enjoyed reading this long-winded post, and CONGRATULATIONS to all the finishers on Sunday! I’ve had a blast training for this and reading others’ blogs as well. Now I need to figure out what to write about, if not my training for the big day. Holy Sh@#@ You are a super hero!! That is such such an amazing time. You qualified for Boston as a boy! 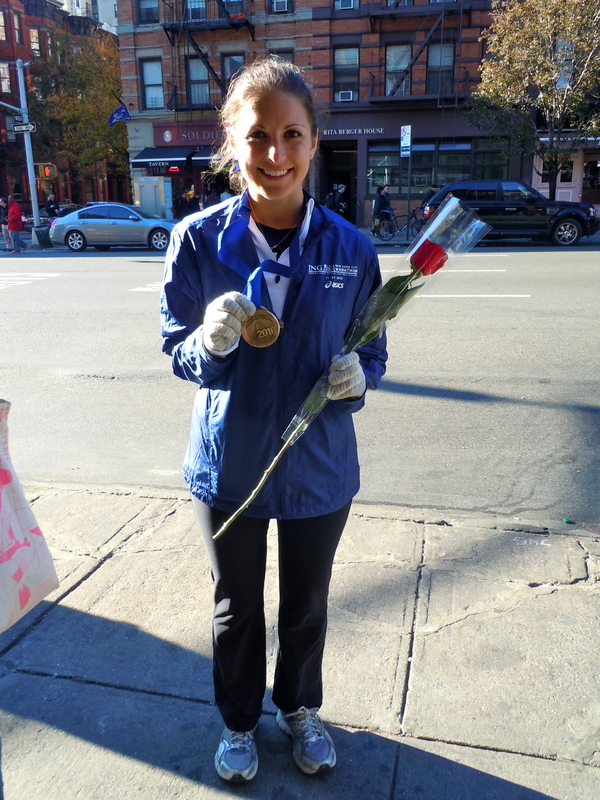 Thats just amazing for your first marathon. I ran Sunday too, a hell of a lot slower than you though!! I agree – Brooklyn was so much better than First Ave. Congrats on a FABULOUS RACE! Can you imagine what you would do in a flat race? Wow…I hope you know that you’re a complete rock star!!!! I recently found you blog while training for the NYC marathon (also my first), and have enjoyed reading about your training. I am so blown away by your time! You clearly have some natural skill in the running department:) I’ll definitely continue following you…if only in the hopes of picking up some tips!! Marathon Fever! « Run, Lindsay, Run!